December makes its best case for a blockbuster this weekend with the return yet again of the Tolkien universe of Middle Earth to the big screen. Further weekends in this month are offering more in terms of overall box office, but if you're looking for one single biggest movie, this weekend is your best bet barring something totally unexpected. 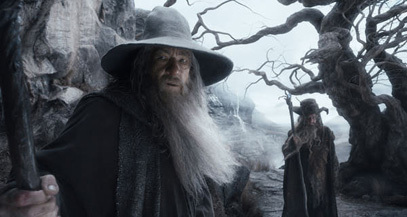 The Hobbit: The Desolation of Smaug is the second of the planned three (each three hours!) movies to be made from The Hobbit. That's the same number of films as made from the Lord of the Rings books, a decision that makes total sense when you realize that the Hobbit is a quarter of the length. Wait... Anyway, this is now the fifth movie Peter Jackson has made from Tolkien's works, but there's beginning to be a bit of a feeling of “homework” about these films. It does appear that we're getting to the good part with dragons and rings and such, but one wonders if fatigue isn't going to catch up to this series. With the padding out of the book in the first film, it did feel a bit like Peter Jackson grabbing you by the lapel and yelling “ADVENTURE! ADVENTURE! ADVENTURRRRRE!” in your face. While I don't expect that there is less action in Hobbit 2: Elven Boogaloo, it promises to be a bit more to the point, with fewer songs about doing the dishes, and oh, I don't know, actually finally introducing the main antagonist of the trilogy. Imagine not introducing Darth Vader until someway into The Empire Strikes Back (yes, yes, the Emperor. Be quiet, nerds). But what's done is done, and here we are getting to the good stuff. As Bilbo Baggins continues his journey with the company of dwarves led by Thorin Oakenshield towards the Lonely Mountain and the lair of Smaug, a dragon (voiced by Benedict Cumberbatch) that has ravaged the dwarvish kingdoms and stolen all their treasure. What a dragon really needs with all that gold is perhaps fodder for another movie (no! No ideas, Peter!). In addition to all this, we get the (invented for the movie) entrance of Legolas, played once again by Orlando Bloom and his pining for an elven warrior played by Evangeline Lilly. More battles with orcs are also on the menu and the whole thing hopefully adds up to an excellent entry in “Ripping Fantasy Yarns”. One can't help but wonder if people have lost a little patience with these, and after The Hobbit, the cracks about the length of the film started to hit home a little more. We're still talking about a film that opened up to $84 million last year, and Tolkien fandom runs deep. I just think this means they can't count on as broad a support as they might have going in to The Hobbit. Tellingly, Smaug is opening in about one hundred fewer venues than the last film, although more are in 3D and have premium tickets. As well, the 48 frames per second version (which is, I might add, the devil) doubles its screens, in an attempt to make the theatrical version more attractive. However, I think we'll look back on the first Hobbit movie as a high point in terms of opening weekends, and The Desolation of Smaug should bring in about $73 million this weekend.